The front last night messed things up again. The water temperature high was 70 degrees. 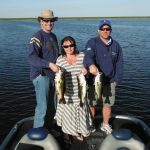 I was working for Bass Online on the south end of Lake Okeechobee. It was a nice day, not too much fish to be caught to today. I fished with a nice couple and a friend, his name was Curtis Donahue and his girlfriend Lynn from St. Louis Missouri. Here is a picture from today.